This is a free event, but as space is limited please RSVP here. 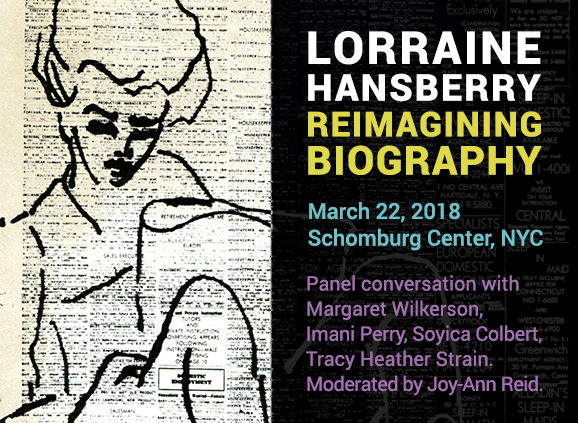 Lorraine Hansberry: Reimagining Biography panelists include Imani Perry (author of Looking for Lorraine: The Radiant and Radical Life of Lorraine Hansberry, forthcoming from Beacon Press in September 2018 and a professor of African American Studies at Princeton University); Tracy Heather Strain, (director of Lorraine Hansberry: Sighted Eyes | Feeling Heart, PBS national broadcast January 2018); Margaret Wilkerson (author of forthcoming Lorraine Hansberry: Am I a Revolutionary? and Professor Emerita of African Diaspora Studies and Theater, Dance, and Performance Studies at the University of California, Berkeley); and Soyica Colbert (author of the forthcoming Lorraine Hansberry: Artist/Activist (Yale University Press, 2019) and professor of African American Studies and Theater & Performance Studies at Georgetown University. The panel will be introduced by Joi Gresham, the executive director of the Lorraine Hansberry Literary Trust, and moderated by Joy-Ann Reid (national correspondent, MSNBC). Pen & ink drawing on newspaper by Lorraine Hansberry. In 1948, Lorraine enrolled at the University of Wisconsin, Madison, where she took art classes. During the summer of 1949 she studied painting at the University of Guadalajara art workshop in Ajijic, Mexico and during the summer of 1950 she studied art at Roosevelt University in Chicago, Illinois.